Ansel DM'd with fans after being told the rapper was problematic. Baby Driver star Ansel Elgort has deleted a controversial post on Twitter after fans raised serious concerns over its subject. 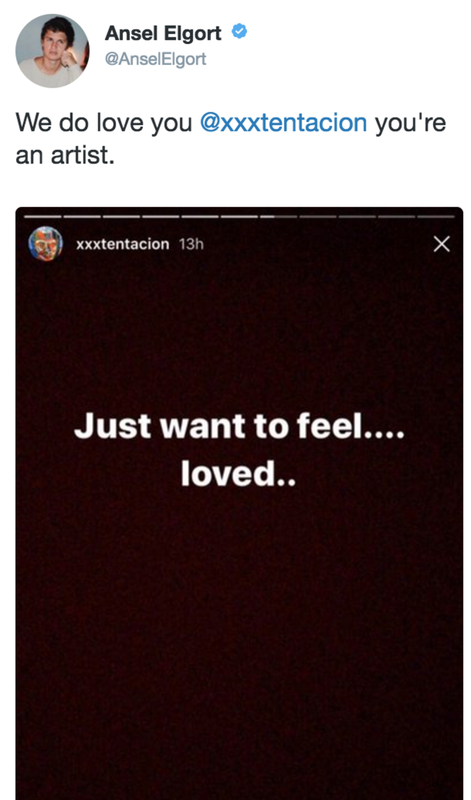 The 23-year-old actor tweeted about controversial rapper XXXTentacion, saying "we love you @XXXTentacion you're an artist". It appears that Ansel was unaware of the rapper's current legal troubles. The unfortunate tweet came as more details emerged this month about abuse allegations against the Florida rapper. XXXTentacion was charged last year with domestic battery and false imprisonment of a pregnant woman. If convicted, the rapper could face up to 15 years in prison. Ansel deleted the post after fans brought up the troubling background of the rapper. The star even seems to have communicated with fans about the misunderstanding. "Damn I just heard his music and liked it I didn't know he did that stuff," he wrote via Twitter DMs. It's clear that Ansel had no idea what a controversial figure XXXTentacion is. If anything, this is a major example of why we all need to be taking a strong stance against supporting musicians who have had serious abuse allegations made against them.